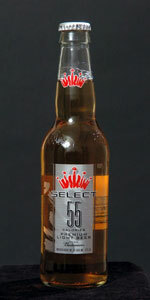 Select 55 is brewed with specialty malts and a blend of imported and domestic hopping. Select 55 has a light golden color and offers aroma notes of toasted malt and subtle hopping. T- While there is nothing impressive about the flavor of this beer, I have to admit that for a light beer with only 55 calories that the flavor is about as good as it can get! There is some very mild malt flavors but with a little skunk mixed in. Of course the finish is nothing special other than clean and a bit adjunct-ish. M- Thin, watery body and with lots of carbonation, but what do you expect?! There isn't much else to say about this but it is crisp and clean which I guess is what it should be! D- This is a very easy beer to slam back! It's light flavor and heavy carbonation would be killer as a patio beer, but I think it would be more effort than it's worth, having to use the toilet often and not getting the desired buzz effect. I'll stick to a standard macro before this but if I'm having a heavy meal, this might be a compromise. A notch below Bud Select but a notch above MGD 64! Ok, so most beer enthusiasts are going to write this one off as a beer not even worth drinking. And yeah, it's not a great beer. But, as bottled water, it's terrific. If you're trying to lose weight, drinking a great tasting beer that has 200+ calories isn't going to get it done. So, unless you're going to give up drinking entirely, something like this beer can help. I think it has a better flavor than Miller 64 and whatever that 64 cal. beer Beck's put out. Pairs nicely with veggie dogs. 55 calories? I thought it tasted like 50, tops. It is better than Mich Ultra, but so is the water you would squeeze out of a wet cardboard box that a cat pissed in. Had this one at a minor league hockey game. Was basically water. If someone gave me a blind taste test with this and a bottle of water I would say this was the water 4 out of 10 times. Bought as a single at Old Chicago. Pours a pale gold, small head of foam. Smells light..grain, weird malt and hop profile, thank goodness it's light? Really to call this beer is an insult to beer. Quite honestly even given the lousy beer Budweiser produces these days, this one takes the cake. This is the most watered down beer I have ever tasted. I find myself adding things to it just to give it a taste. I would write about the taste if it had one. To give this a review on flavor would be like giving a review on the taste of water. True it only has 55 calories, and it tastes like it. I would just as soon not drink than drink this stuff. Really. I love a good full flavored full bodied beer. That being said, I cannot drink like a 21 year old anymore and have some health issues to boot. Bottom line here is that this beer won't kill me. It's low alcohol content allows me to cut my alcohol intake by more than 50%. For what it is, Bud 55 looks, smells and tastes just enough like beer to make it work for me. Am I happy about it? No. Pours completely clear light gold and almost completely devoid of any color with a 1 finger foamy white head that faded quickly; looks like water and yet it still had decent lacing, which is strange. Smells like grains, hay and grass, and barely had any odor at all. Very weak nose overall. Tastes like grains, hay, lemon, grass, faint citrus hops and some very light caramel. Basically it tasted like club soda poured into a beer glass with a little beer left over at the bottom. Mouthfeel was light, crisp and watery with very light carbonation and a refreshing feel that helped this beer go down fast and easy. It's easy drinking, extremely light and lacks any real flavor. Great if you are looking to drink something that resembles beer, but this is not what is beer is about. This is 12 ounces of liquid to rehyrate with in between tasty beers.